We've looked at Waddell's both for beer and wings before, but how does it all come together when you go there for the grill(e) part (the "e" is used on their sign, but not many other places... go figure)? Kinda shaky. 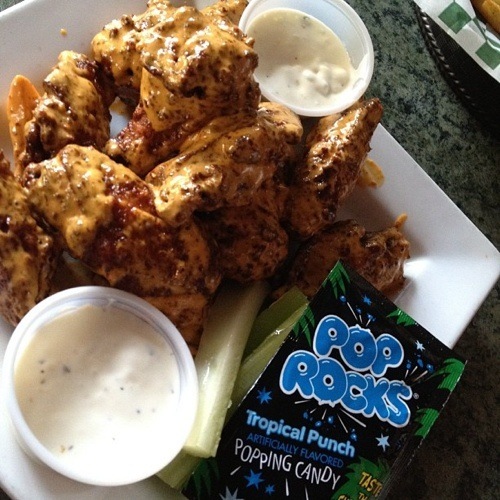 Kinda shaky, yet Waddell's serves what probably should be Spokane's bona fide signature dish: hot wings with Pop Rocks. Let me repeat: Hot wings. With. Pop Rocks. You're clinically dead if that doesn't blow your mind. Outside of the hot wings, the food is just so-so. We tried the brisket sandwich, and the sauce was way too sweet, soaking into a bun which had that store-bought quality over it. Not a great success in other words, and the accompanying fries were dull. Much as Waddell's tries to sell their Squirrelly Beaver Sauce, it is just a bit too similar to Red Robin's seasoning. With that said, the hot dogs aren't bad at all, but they're still just that... Hot dogs, and not cheap ones either. Waddell's has made a good name for itself with the beer selection, and that's well deserved. Personally I find the emphasis on IPAs to be a bit too great, but take that for what it's worth. As far as the combination of hot wings and beer goes it's hard to beat Waddell's. The rest of the menu is not an instant success, but then again, not an all-out failure either. Proceed with caution if you decide to head up there. Do you recommend Waddell's Neighborhood Pub & Grille? Make your voice heard!